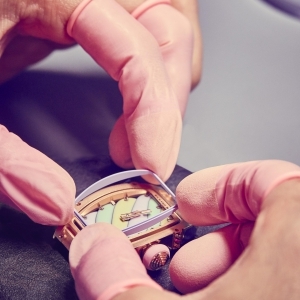 Last September two brands, Audemars Piguet and Richard Mille announced that they will leave SIHH from 2020. 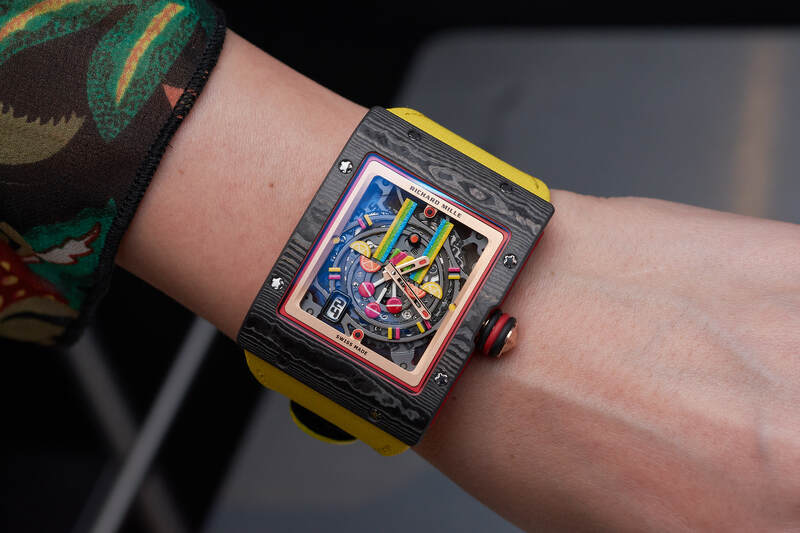 ‘The brand’s presence at exhibitions no longer corresponds to its strategy for exclusive and selective distribution.’ – explains Richard Mille. 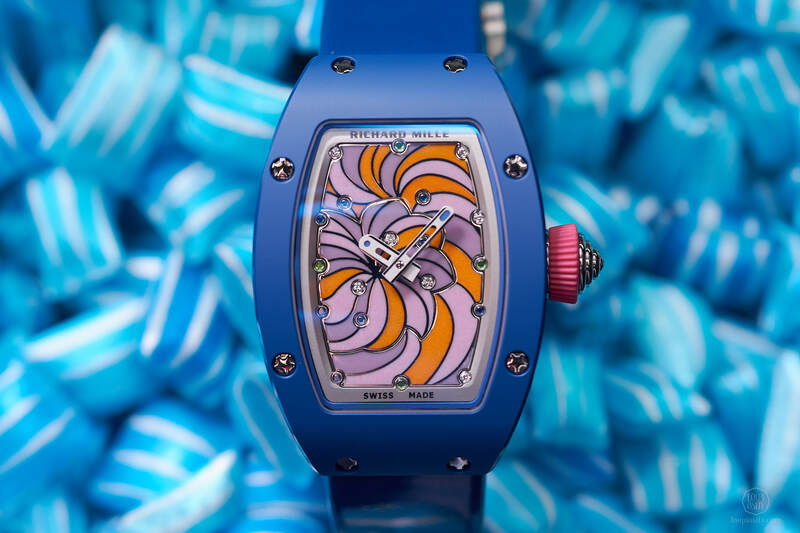 Just about a week before the news broke, Richard Mille stood up introducing a new partnership with Frieze Masters and Frieze London. 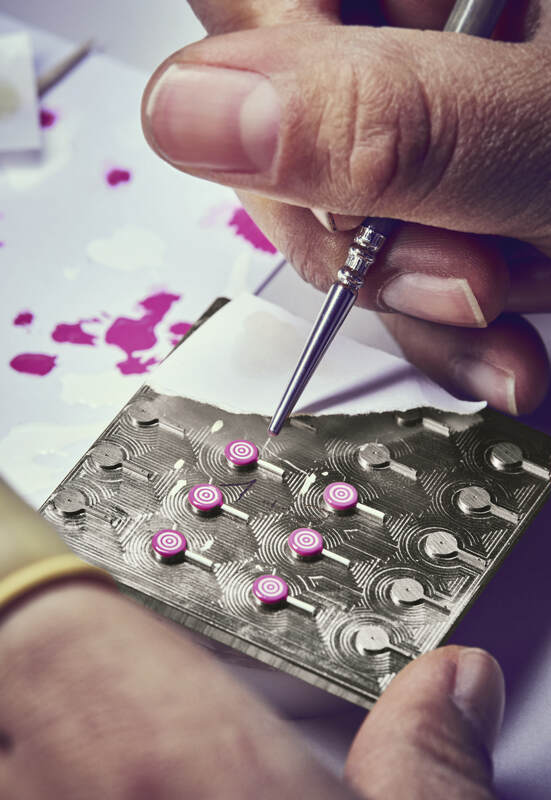 Frieze London is the get-together of some of the world’s most significant contemporary artists and collectors, while Frieze Masters features six thousand years of art history from more than 130 galleries. 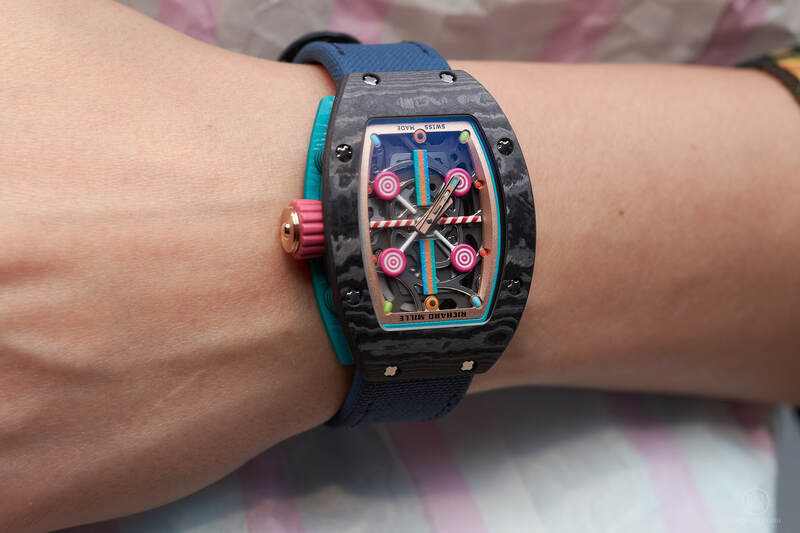 Richard Mille joins an illustrious group of event partners including BMW, Hotel Café Royal, Ruinart or Diptique. 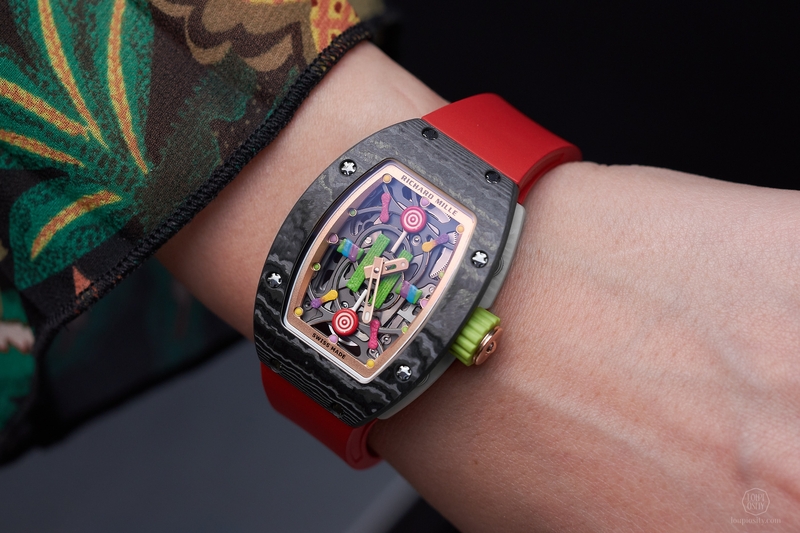 Celebrating their vibrant soul and technical achievements at their debut on Frieze, Richard Mille brought together a museum-level overview of some of the most exceptional and rare examples generously loaned by private collectors. 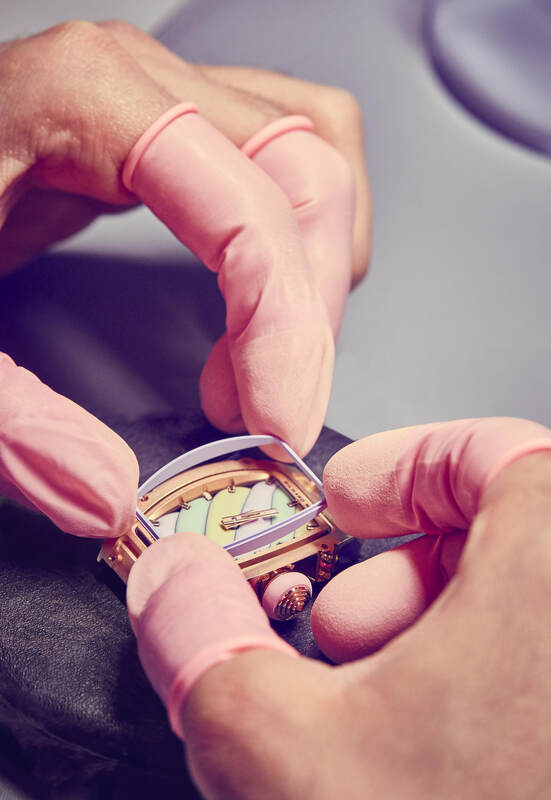 The brand’s approach to watchmaking is to liberate watches from their restricted role of being a tool for timekeeping within the safe every-days. 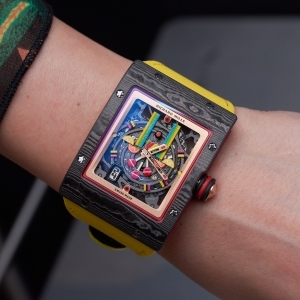 Richard Mille has been exploring the extremes both in terms of technology and looks. 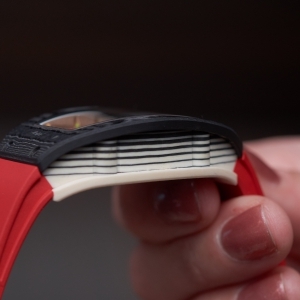 Creating ‘racing machines on the wrist’ it is no longer a surprise to see athletes wearing RM during the height of the action. 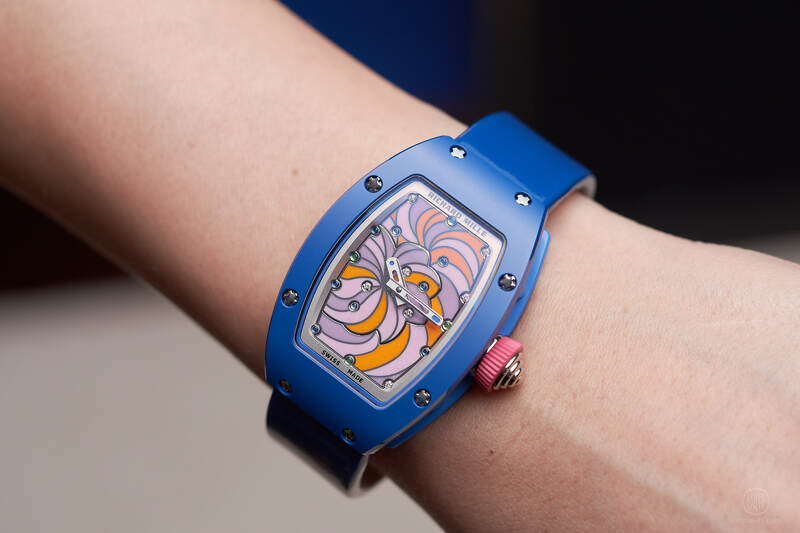 Artistic collaborations such as the one with the street artist Cyril Phan, (aka Kongo) bring models further away from the chartered safe waters. 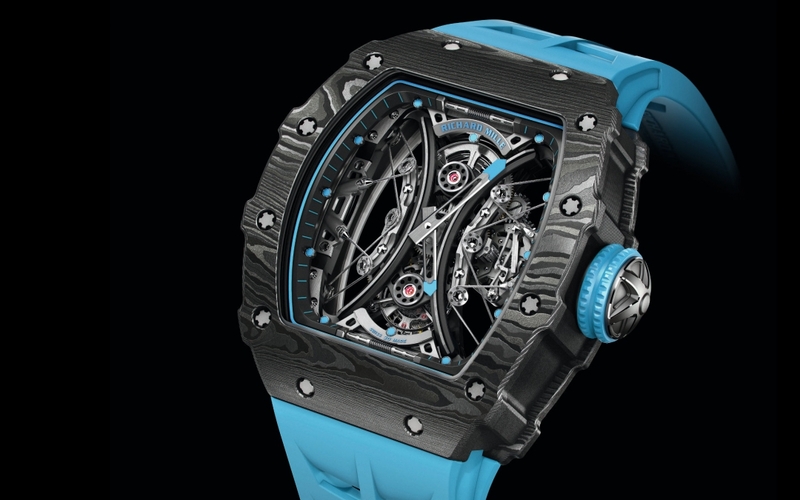 RM in cooperation with Kongo recently introduced the RM 68-01 Tourbillon, limited to 30 pieces. 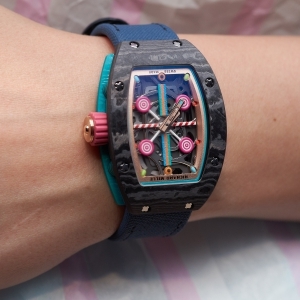 Richard Mille used the same pen to draw up an unexpected collection for SIHH. 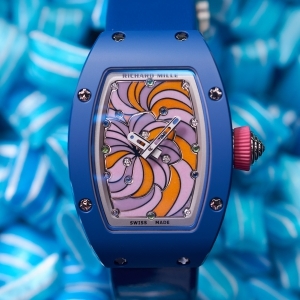 The sweetest collection comprises of 10 models, each produced in a limited edition of 30 pieces. 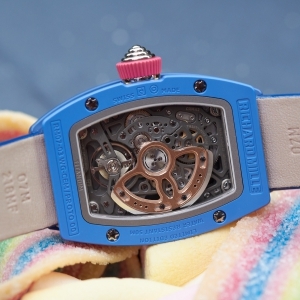 They are based on three models, the RM 07-03, the RM 16-01 and the RM 37-01 and are divided into two lines: the Sweets (the RM 07-03 Cupcake, the RM 07-03 Marshmallow, the RM 37-01 Lollipop and the RM 16-01 Liquorice) or the Fruits (the RM 16-01 Lemon and Strawberry, the RM 07-03 Blueberry and Litchi and the RM 37-01 Kiwi and Cherry). 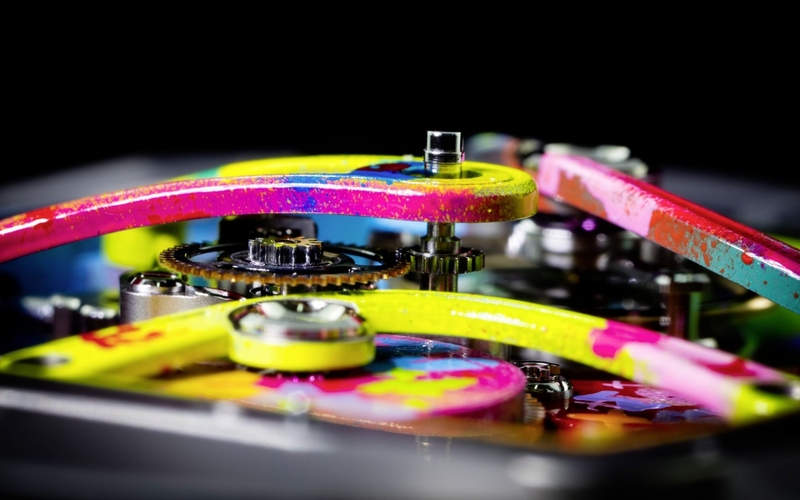 Playful as they are, the 10 models embed the technical feats delivered by the research implemented also on the high-tech models you would first think of: the variable-geometry rotor with adjustable effectiveness, the fast rotating barrel or the special teeth profile on the wheels. 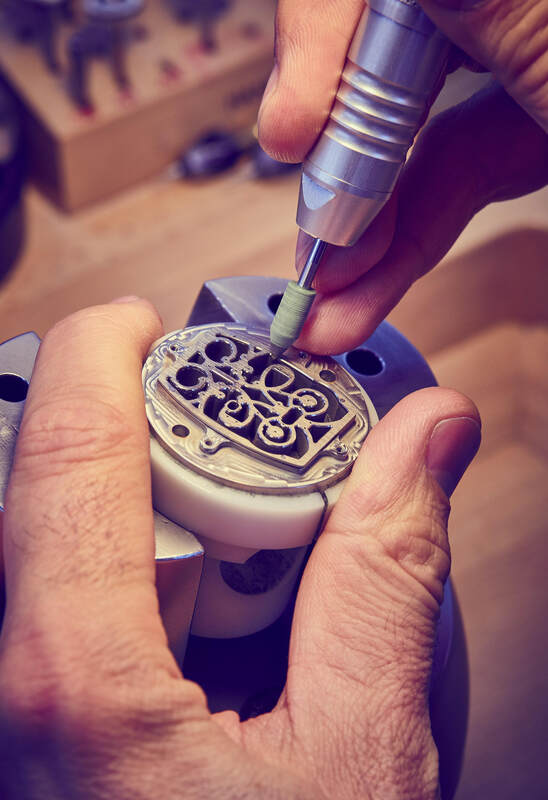 These pieces however brought something quite tricky to produce: even more vivid composites – some ceramics, others a material called Quartz TPT®. 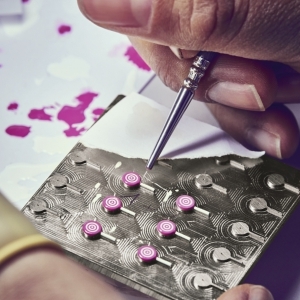 The trick here is to guarantee a certain colour after firing and cooling the material – without fading for hundreds of years. 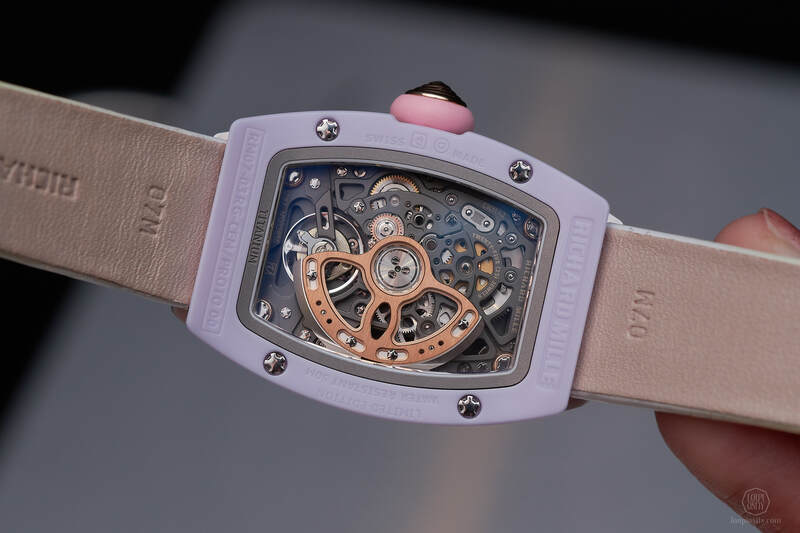 In order to experiment and use thin ply prepreq further, Richard Mille extended the on-going partnership with lightweight prepreg materials expert NTPT (North Thin Ply Technology Sàrl, Renens, Switzerland) in September 2018. 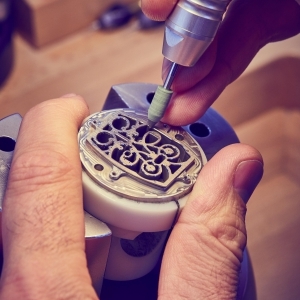 They jointly announced NTPT’s new production facility and a cleanroom dedicated to the manufacture of Quartz and other non-carbon fibre materials. 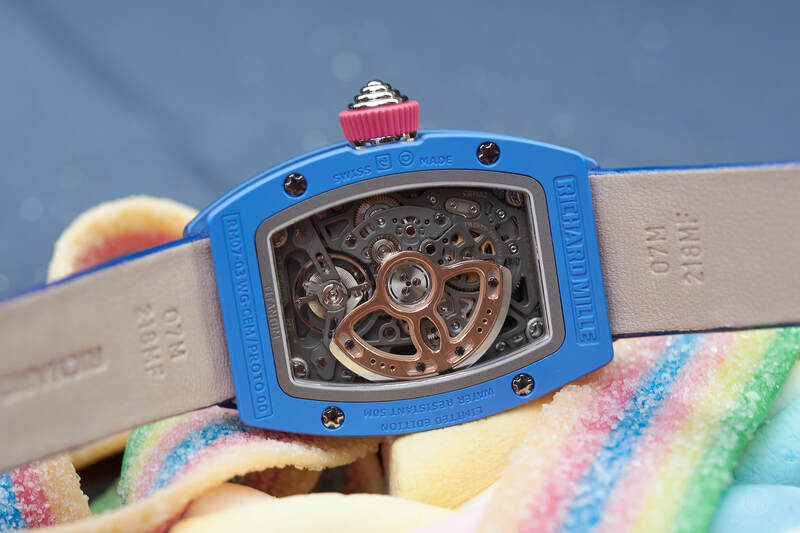 The material NTPT is supplying to Richard Mille exclusively in watchmaking. 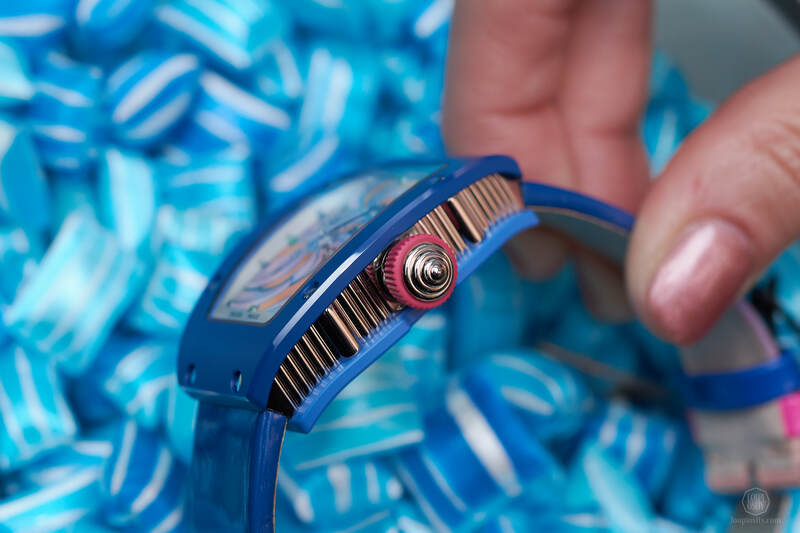 The Fruits of the Bonbon collection are probably the best messengers of what they are currently capable of in terms of applying the technology in luxury products. 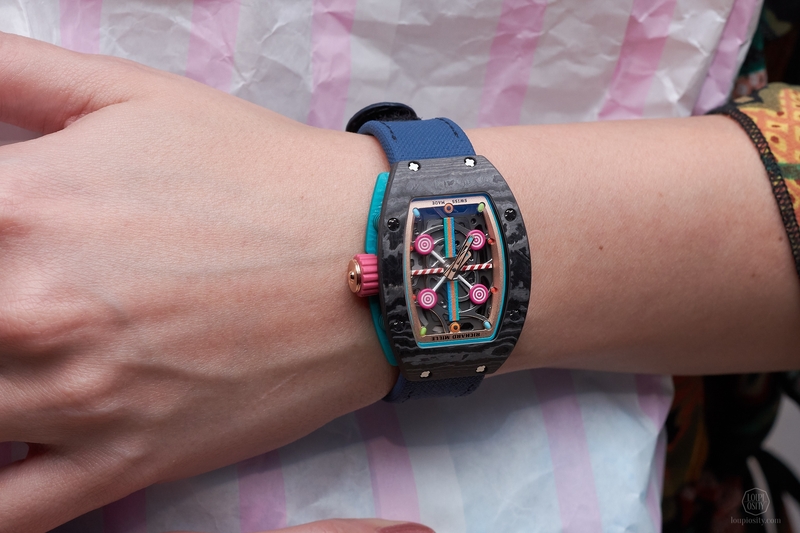 The bezel is Carbon TPT® (hence the grey damascene pattern) while the case-back is Quartz TPT® in various colours. 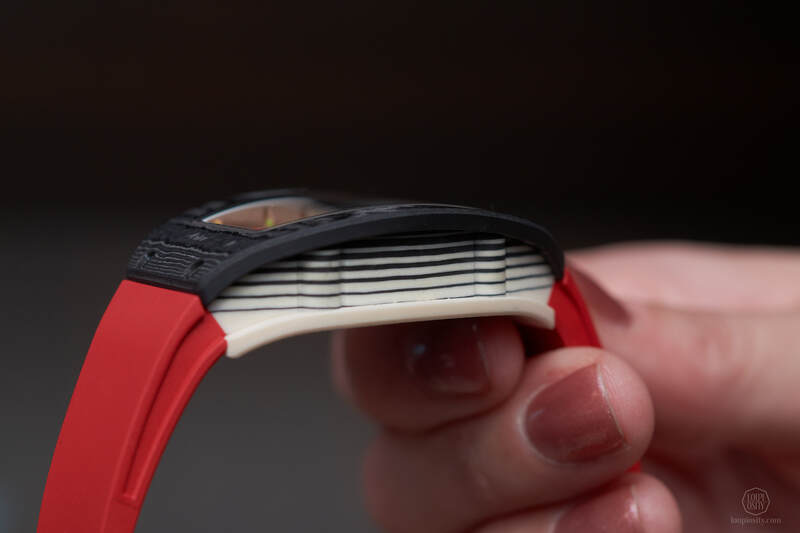 Varying Quartz and Carbon TPT® layers result in awesome striped patterns when looked at from the side. One fantastic attribute of the material is its lightness. 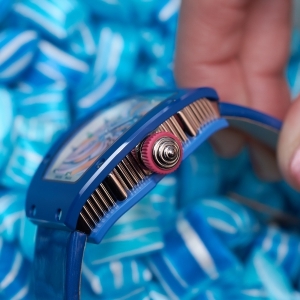 The weight of the watch goes unnoticed when wearing. 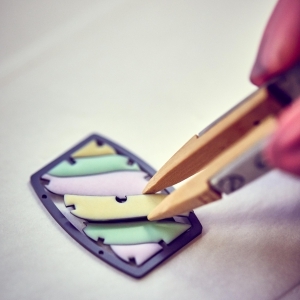 The colourful ingredients for the Sweets are TPZ ceramics (95% yttrium-stabilised zirconium) and gemstones. 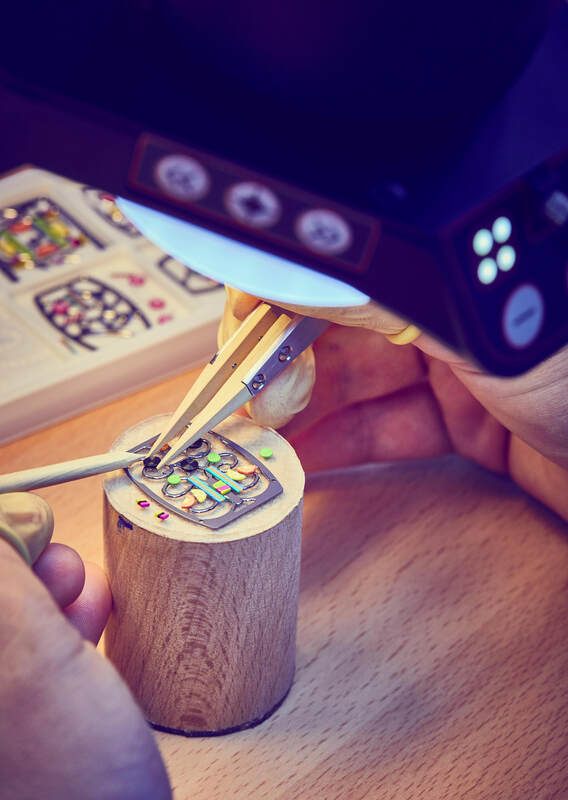 Precious metals are also used for the case, making them somewhat heavier than the Fruits. I have a strange affinity to marshmallows. 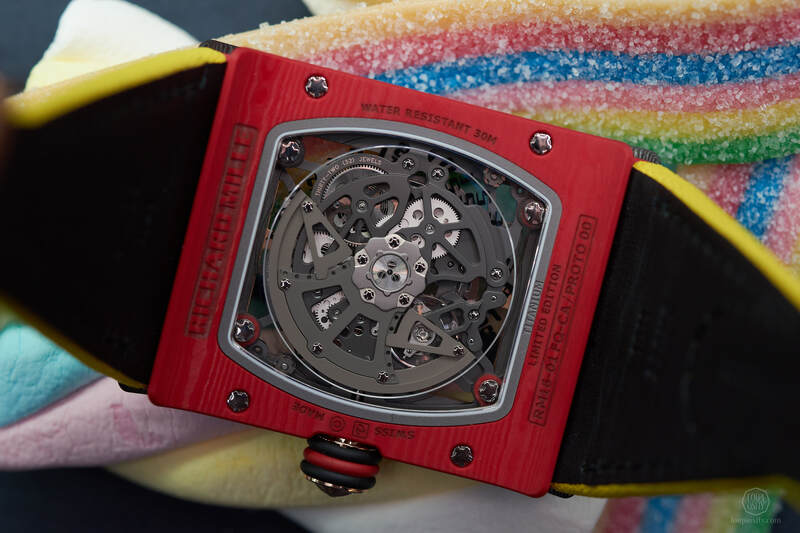 Not particularly to eat them, but to touch and squash its fluffy material obsessively… The RM 07-03 Marshmallow piece was obviously the first I reached out for. 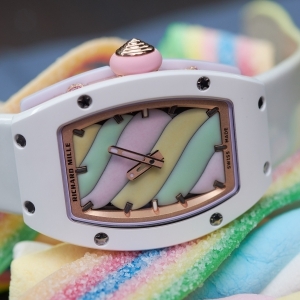 Squeezing the composite would have been tough, but the hand-enamelled dial imitated the soft structure and colours of the candy so amazingly. 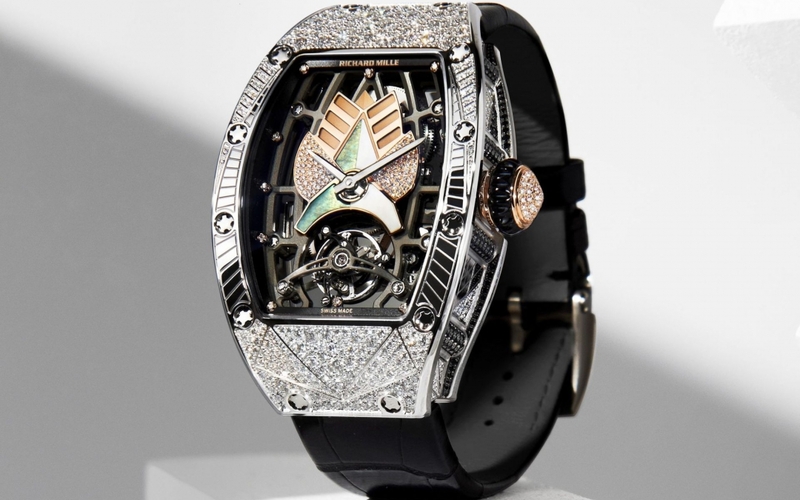 The gemstones (tsavorite, pink sapphires and citrine) set on the pillars of the case would also break my teeth. 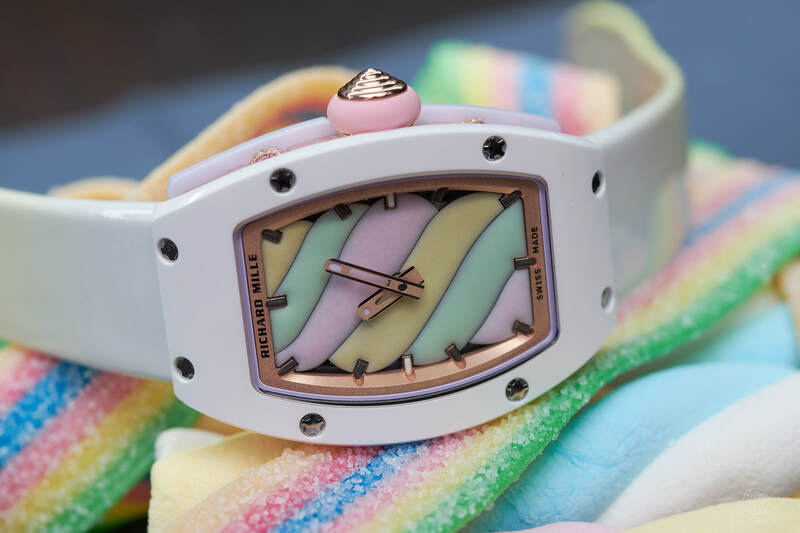 The Cupcake timepiece has a Grand Feu dial as well but with a different finishing; it is highly polished to produce the sparkling transparency appropriate for tart sugar candies. 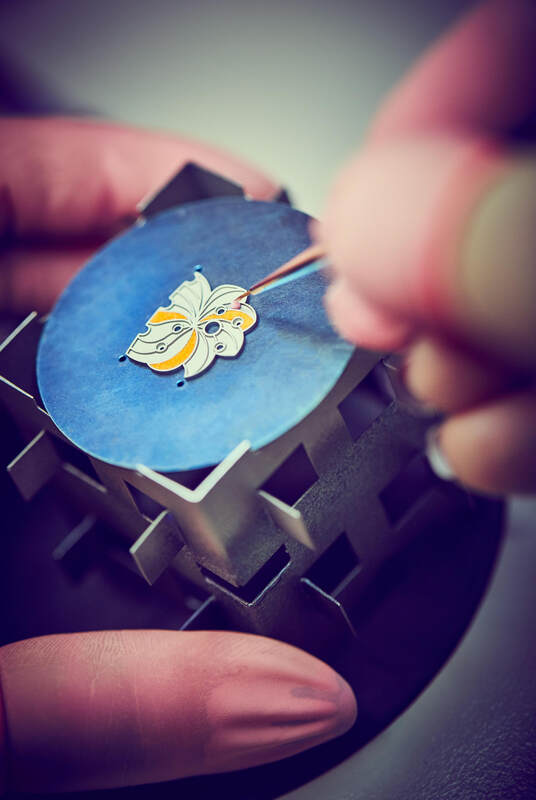 The cupcake dial is decorated with sky blue sapphires, tsavorite stones and diamonds, dark blue sapphires and tsavorites for the indexes. 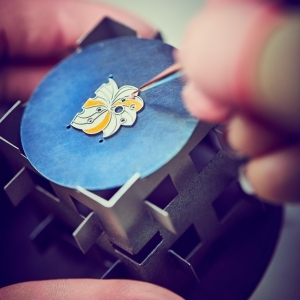 Many techniques had been used for the pieces in general – Grand Feu enamelling, special finishing methods, miniature hand painting. 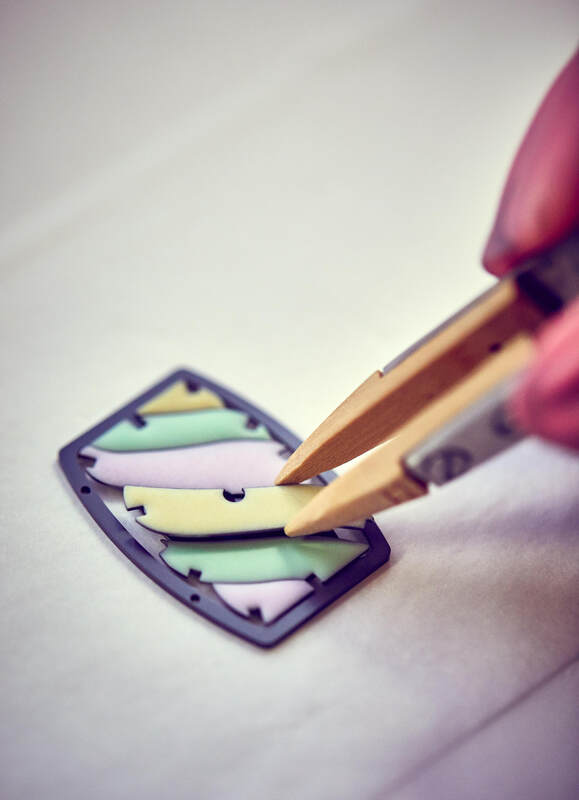 The tiny painted sweets (like gumdrops, lollipops, barley sugars and liquorice rolls) are made from sheets of solid titanium. 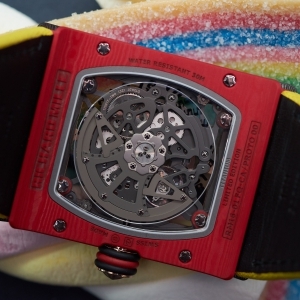 The 4 models from the Sweets line and the 6 from the Fruits will be produced in an edition of just 30 pieces each. The booth reflected Cécile Guenat’s design, of course. Under the berlingots and frosted lemon slices hanging down from the ceiling we saw people immediately loving the models and others feeling the tasters a bit sour. 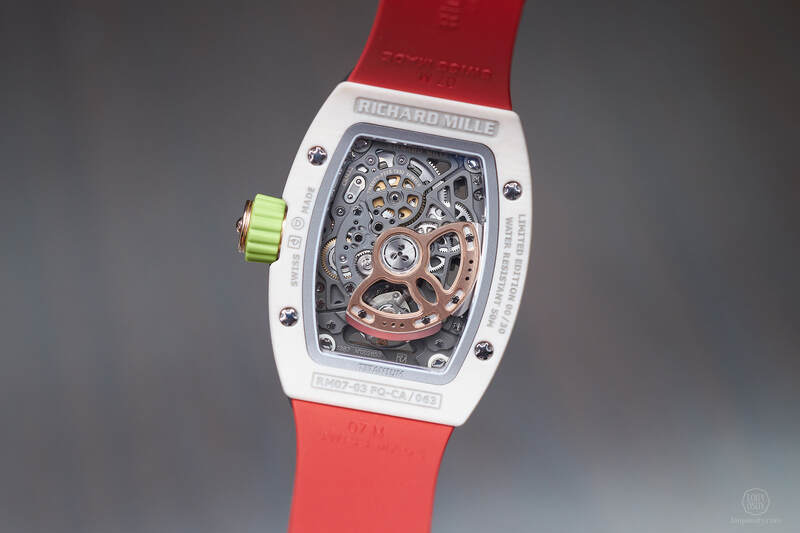 Since he launched his own company, Richard Mille has built up his image of being the high-tech performance sports watch manufacturer – an image that brought him success and carved out a unique space and returning customer base for his products. 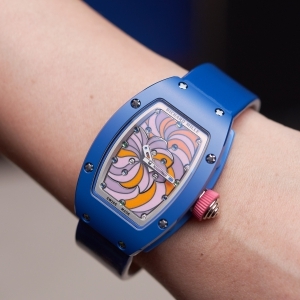 It’s an image that hard-core RM fans might feel incompatible with the power candy collection he just presented. However, I think that it is a pretty amazing feat. 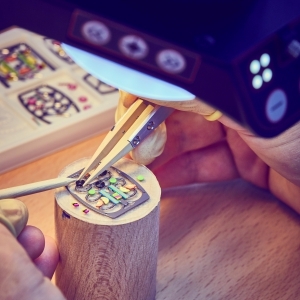 The models represent the design and technical progress of the brand while bringing novelty in style. 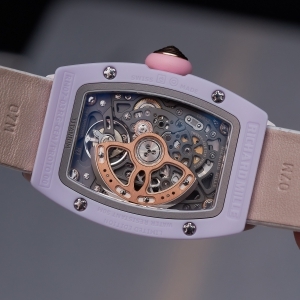 The witty topic ingests new excitement into the world Richard Mille has created for himself years ago. 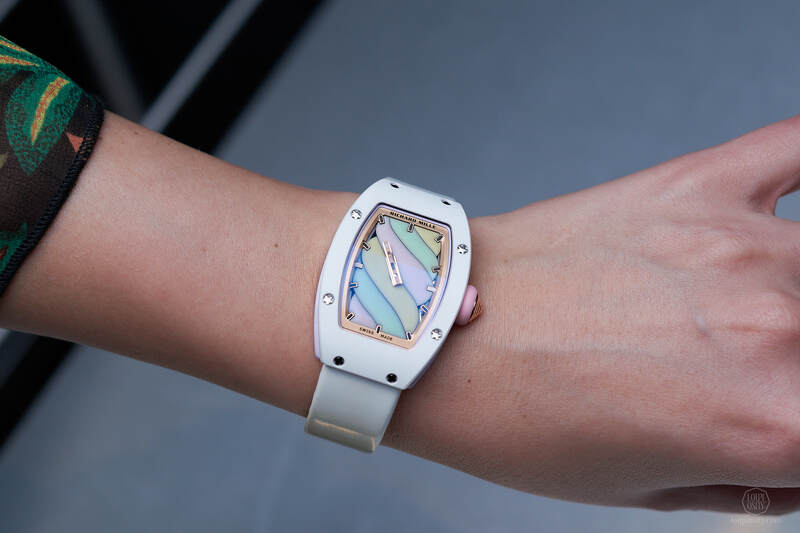 This could be essential in widening the spectrum of customers, but the new fun artistic theme seems to be also an association to the contemporary art world RM has set its sail for. 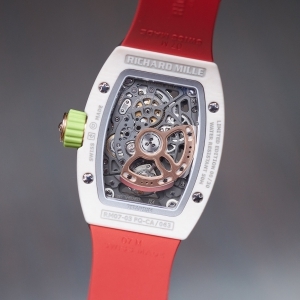 Photo credits: Richard Mille © Jérôme Bryon. Loupiosity.com.